The first part of the Doctor Who series finale Dark Water was pretty great. I know you haven’t heard me say that this season, and believe me; it was refreshing to not be mad the entire time and to be actually enjoying the acting and the plot line. Follow me under the cut for a closer look at Dark Water. Some of you may have read the theory I posted last week which has been a long time in the making and the believing, however, there were certain aspects I thought would happen since the beginning of the series, and some of those came to fruition last night. If you want to read the theory before delving in, you can do that here. Rather than walking through the episode, I’m going to hit on major events and link some of those to the theory as well. 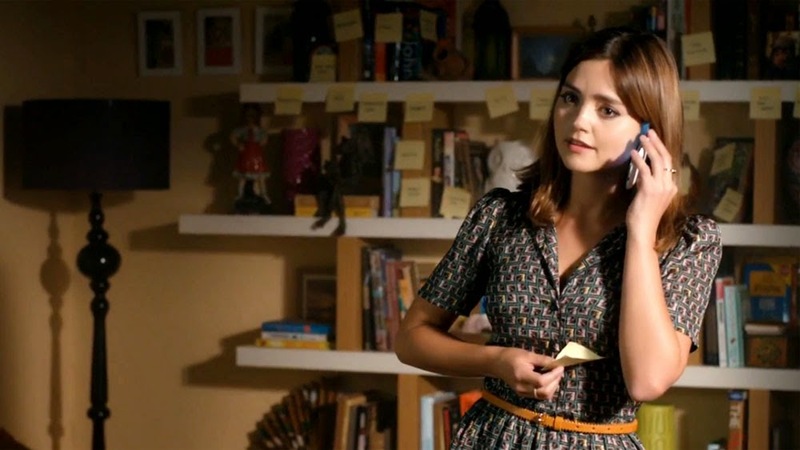 The episode starts with a very out of character Clara (more out of character than usual), in her apartment, surrounded by post-it notes. She is talking to Danny Pink. When I say out of character, I mean that she is speaking like this incarnation of the Doctor (saying shut up a lot and weirdly telling him this is the last time anyone will hear her say ‘I love you’). The tone of her speech and the conversation suddenly shift and Clara discovers that Danny has been hit by a car and is dead. Although the strange behaviour at the beginning of the episode isn’t explained, I have high hopes that it will be in the finale. Danny on the other hand, is the focus of the rest of the episode. His death is actually somewhat moving not because, as Moffat and Co. would like us to believe Clara was truly in love with him, but because she lost someone. Jenna-Louise Coleman’s performance totally sold me on the death of a character I loathe and whose relationship with her I believe is the absolute low point of this season. She was numb, confused and desperate. The short appearance of her grandmother was wonderful, and I am actually sad we didn’t get more of that. We see Clara lament that Danny’s death was so normal, ordinary, there was nothing ‘terrible’ about it, and I guess that is spelling out how she views her own risks with the Doctor and why she does what she does. She calls the Doctor and threatens him, demanding that he take her back to a time before and that they save Danny. 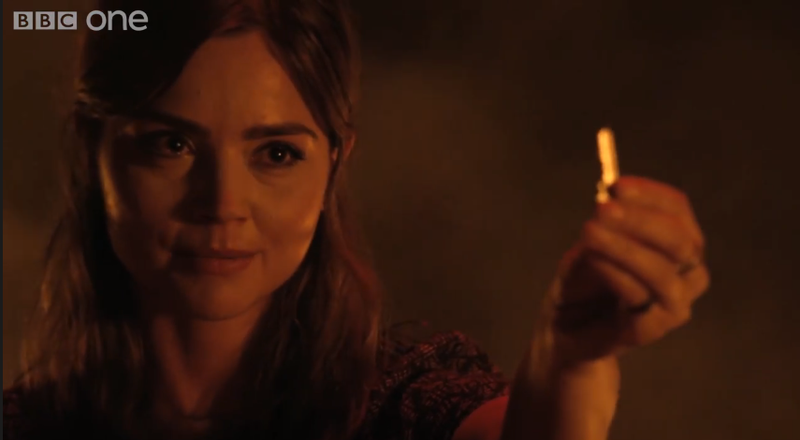 Seemingly, Clara has found all of the TARDIS keys (she knows where the Doctor hides them all linking back to the Impossible Girl arc) and has tricked the Doctor into a volcano. Inside she has tossed all of the TARDIS keys into the lava and destroyed them because the Doctor will not help her save Danny. The Doctor reveals this was a hologram and that the test was actually by him, on Clara. He wanted to see how far she would go and now he knew. He then says that he will help her find Danny in whatever afterlife might exist, and when she demands to know why he is helping her after she betrayed his trust and friendship, he simply says ‘do you think you mean that little to me that you betraying me would mean I wouldn’t help’. It’s the first moment in the entire season when they have felt like they did when Clara and Eleven were together (towards the end). There are two important things here pertaining to my theory. The first is that Danny Pink dies and that this causes Clara to do something drastic – both parts of what I thought would happen. Whether Danny’s death was orchestrated by Missy still remains to be seen, however, it’s difficult to buy that it’s a mere coincidence. The second important point is the betrayal that Clara herself committed, she seemingly strands both herself and the Doctor inside a volcano, without a TARDIS key, to die. This is an extreme betrayal and the Doctor does not give up on her. Surprisingly, she was willing earlier this season to give up on him for a lot less. This will be crucial to watch as it’s a potential precursor to her turning on him (if that is indeed what happens). 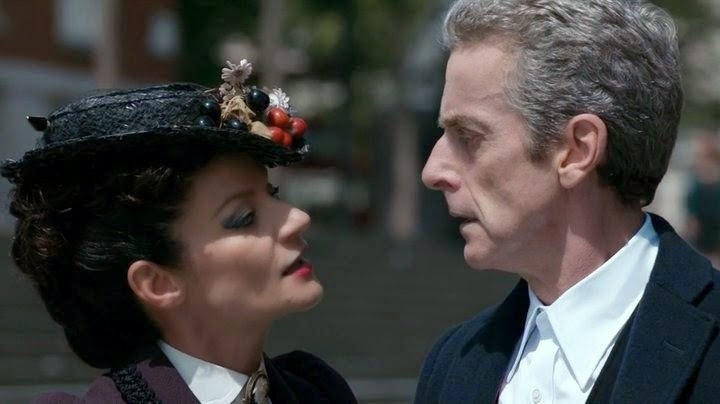 Clara and the Doctor use the TARDIS and Clara’s connection to Danny to try to find him in the afterlife. In the meantime, Danny has woken up in the ‘Netherspace’, a cosmic city of the deceased. He’s greeted by Seb, played by Chris Addison, who is one of the highlights of the episode and is a genius casting choice. 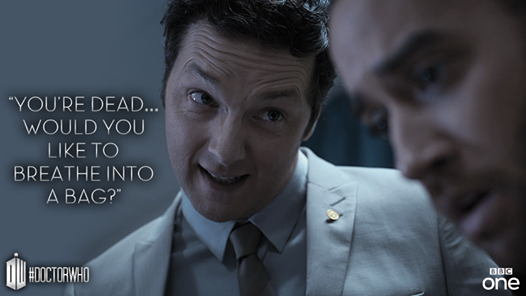 Seb talks Danny through the after-death policies and paper work in his future while Danny freaks out a fair amount. Confrontingly, a little boy comes to see Danny, a boy whom he accidentally killed during his time as a soldier. It’s the first time I have felt any pity for Danny, and the first time he started to seem like a three dimensional character. 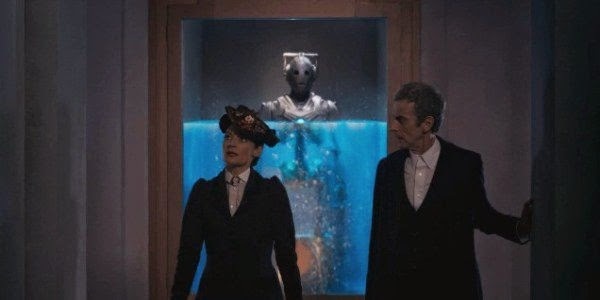 Clara and the Doctor are meanwhile in a mausoleum of sorts, surrounded by skeletons that seem to be sitting on chairs suspended in water. 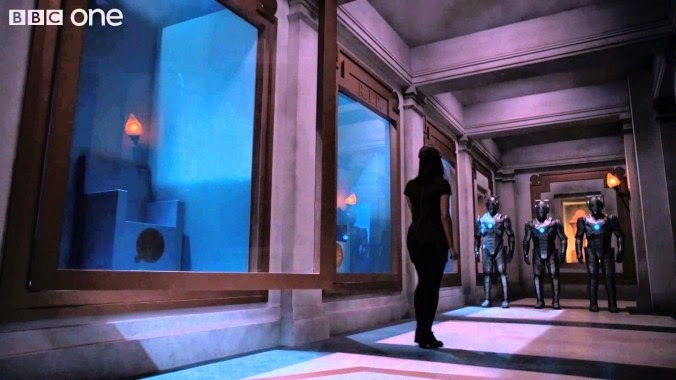 As they explore, Missy appears saying she is actually an android (this didn’t fool anyone!) and explains that this is like a post-funeral home, keeping the dead comfortable, safe and happy. A Dr Chang explains to Clara and the Doctor that the water that the skeletons are suspended in is Dark Water; only organic material can be seen through it. This means that the apparatus keeping the bodies seated does not interfere with viewing the body. Further, Dr Chang also explains that the home was created when people realised their worst fears; that the conscious mind was linked to the body in its past life and that if that body were cremated with the consciousness linked, they would feel everything. It’s a really scary concept and totally drags the viewer into the deceit. Meanwhile, Seb is telling Danny to think of this place like you would think of babies in the womb if they could talk to each other. They would think that life was 9 months long and then you die. It’s a great analogy and a great way to ease a new person through the shock of their previous life. I think this is what I liked most about the episode, that the new world and space was created with such real human concerns and fears and such deep and thoughtful insights. I also laughed hysterically at the joke about iPads in the afterlife when Seb said they had Steve Jobs. Black humour. Danny and Clara manage to be connected via the wifi, and the Doctor encourages Clara to, no matter how painful it is, test Danny and make sure it’s him. This is potentially the thing that will break Clara’s trust and bond with the Doctor as we all know that Danny is who he says he is, but as he hasn’t found a way to prove it before Clara basically says she will kill herself to be with him, Danny deliberately allows her to believe it to be a trick and disconnect. It is the last time she will speak to him presumably – and therefore, the previous time she spoke to him on the phone was the last time that she said ‘I love you’, mirroring the start of the episode. In the meantime, Missy has drained the water in the tanks revealing them all to be Cybermen! It’s pretty genius really, and while I theorised that she was getting the consciousness’s through some technology, I never realised that she was getting the bodies too because their base was on Earth all along! Amazing! There’s also some speculation that the bodies and the minds don’t need to belong to the same host, which opens up a range of interesting questions. The Doctor sees the big hard drive that all the consciousness’s are housed in and nots that it is Time Lord technology. It’s what Danny believes is some other after world. Inside the after world, Danny is distraught after his final conversation with Clara and Seb gives him an iPad with the option of deleting (ominously) those pesky emotions he’s feeling. Cyber-Danny is TOTALLY a thing that is happening. 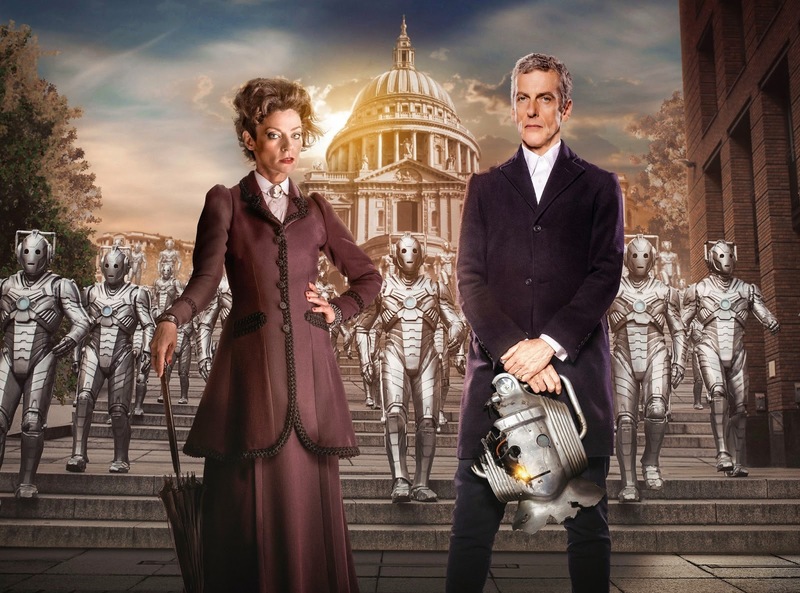 As Cybermen invade London, the Doctor is mortified to learn that Missy is, indeed, as I have theorised, the Master. A female Master, a Time Lady (for she is old fashioned). She had me wondering for a moment whether it WAS going to be Romana. But it’s the Master and in theory, a very interesting final episode ahead of us! At this stage, my theory could go any number of ways and I’d prefer not to bet any other way. I still think Clara is going to turn on the Doctor, it might be a trick but I really hope it isn’t. I still think there is potential for her to either be the instrument of the Doctor’s demise or the Master’s new companion (which would be the best outcome), but I also think there is a very real chance that she will die. I really don’t want that to be the case, it’s been done a variety of ways, and while I could totally buy it with Rory and Amy (for example), Clara and Danny just seem like a non-couple. Her dying for Danny just doesn't make any sense to me, even with the qualifier that she never really 'existed' because of her jumping into the time stream. If she did die, it’d be a big cop-out, but that's probably the way the story will end up going - Moffat seems committed to the Clara and Danny thing. Seeking vengeance in the wrong place might be cool, and the Doctor hasn’t recently had a companion completely turn on him (I think the most recent is in the audio books). I’m actually excited to see how this plays out next week!